Two years ago, we’d asked Pavi to look for a house for us in Pondicherry, without ever having seen the city – we knew we’d like it. Then, over the years, we rationalized that Bangalore would probably be a better place for us. First, the weather would be cooler. Second, we would have access to cultural events in English because Bangalore draws people from all over India (and the MNC [multi-national corporation] world). Third, it is a central transportation hub, and we would be assured of getting visitors. We had even floated the idea of Bangalore to Ayla’s mother, who had wanted to go in on a house with us in Pondy. We spent three days in Bangalore before going to Nagapattinam on January 20, and we could not breathe. Yes, it was great to be “home” at Dinesh’s, just as it was great to be “home” at the Krishnan’s in Madurai. The eating is fantastic, the shopping is good and easy, and the people, at least the people we meet through Dinesh and some of our other “service” friends, are wonderful. Pratiba has grown to be a well-adjusted dog, and still has the endearing curled-over-at-the-end tail. (While Saki in Madurai, who has grown better-looking with age, still cannot fully control his bladder – he’s still doing the “I’m so excited to see you I have to pee” piddle at age 2+.) And Dinesh’s cousins still provide material for soap operas. We took an overnight bus from Bangalore to Pondicherry, which arrived at 4:30am. We sat at the offices of the private bus company, which also doubles as a package courier, for two and a half hours, until we were picked up to go to Nagapattinam. We spent most of the day in Nagapattinam, the most heavily tsunami-affected area in Tamil Nadu, at an NGO coordination meeting, then caught a ride back to Pondicherry with Raju and Geetha Rajagopal, who were driving back to Chennai that evening. Pavi, who was at the Aravind Eye Hospital in Pondicherry, acted as our concierge, and found us one of the few beds in Pondicherry at the Villa Pondichery. (We could not stay at the Aravind guest house because Rahul Gandhi was visiting the next day, and the buildings were under security lock-down. We were not sure we would be returning that day, so Pavi had not put our names on the security list in time.) We vowed to sleep in the next morning, and spend some time exploring Pondicherry before heading to Auroville the next day. The next morning, while Mark slept in, I spent some time with some of the other guests at Villa Pondichery. They were from Paris, and they come every year to Pondicherry to spend time with the owner of the guest house, Pichaya Manet (great name, eh? ), who is an artist. One of the guests invited me to the opening of an exhibition of Pichaya’s paintings that evening, at the Alliance Francaise. I was able to get a map and some basic guidelines about the city from Ashok, who works at the guest house. He pointed out where we were, at the southern edge of town, and the Muslim section we had to pass to get to the French section, fronting the water. (Dinesh told us about White Pondy and Black Pondy, separated by the canal.) Mark and I spent the rest of the day walking around Pondicherry. Immediately, we start looking at buildings, picking out “the” one. It soon became apparent that in many lanes, off the major streets, any one of the buildings would do. We explore the bazaar, whose bordering streets prohibit 3- and 4-wheelers; eat at Salem Biriyani House, where we throw the waiters in a tizzy, as we usually do, because I do not go upstairs to eat with the other women (eventually, a waiters puts us in one of the small, curtained rooms with two other guys, who try to keep poker faces); and find two of the many Satyam iWay Internet cafes in town. I don’t know how we did it, but we did. 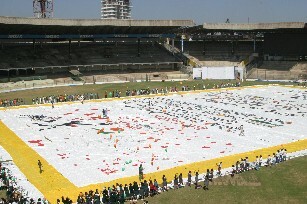 Less than a month after John Silliphant and Mark Peters arrived in Bangalore, less than two weeks after Mark and I got involved, and with the inexhaustible efforts of Maria Durana, we held an amazingly successful event at M. Chinnaswamy Cricket Stadium in Bangalore on January 16 – the creation of the “World’s Largest Letter”. 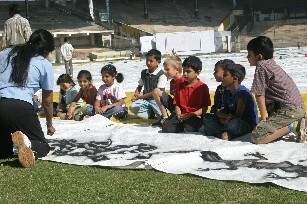 Close to 500 children joined Bangalore-based artist John Devaraj and the children of Born Free Art School in painting a letter to the children of Pakistan from the children of India. Dear children of Pakistan, Let’s join hearts in friendship. Together we can make a better world. The children of India. Mark has the full story of the letter-writing campaign on his blog. I’ll just post some pictures, as requested, here. How are you? I am very glad to send you this letter. I love my country and I want that there should be peace happiness. I know that you also want that the people of your country should live happily without any war and fighting for religion. I don’t know that from my letter everything will be alright but I know that one person could understand my feeling and that is you. I want you to understand and make others also. “a campaign so simple, it just might work…“. It all started in early August 2005 when John Silliphant and Mark Peters, deeply involved in a tree planting project in Ahmedabad, found out that they had to leave the country within the week to get their Indian visas renewed. What to do? They decided to make the best of this expensive and unwelcomed proposition by collecting cards and letters of friendship from school children in Ahmedabad to take to school children in Pakistan. At their first school, they got 700 cards; in 2 days, they had 3,000. Overwhelmed by the positive response of the kids, they decided to continue to collect cards on their way to cross the border. In three days in Chandigarh, they collected 7,000 cards, letters, poems and drawings. By the time they got to Delhi (and secured a 3-month visa extension), they had over 20,000 and had captured the attention of Gopi Desai, a documentary filmmaker. By early October, John was very ill and was forced to return to the care of Jayeshbhai and Anarben in Ahmedabad and Mark P. decided to spend a month in Pakistan doing what he could for earthquake relief. The project was put on hold. Mark and I returned to Pondicherry from Sudan December 17 to find that John had blitzed through Pondicherry that day, not knowing we were back, and was now in Bangalore. Since Bangalore is an overnight bus ride away, we decided to join them for a few days, starting December 28. 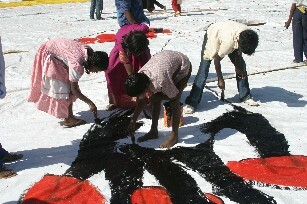 The “letter” is going to be the “world’s largest letter”, painted on a tarpaulin measuring 80 yards by 120 yards, a letter of friendship from the children of India to the children of Pakistan. 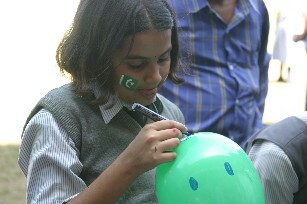 The body of the letter will have a message written in Urdu, Hindi, and English: To the children of Pakistan. Let’s join hearts. Together we can make a better world. The children of India. 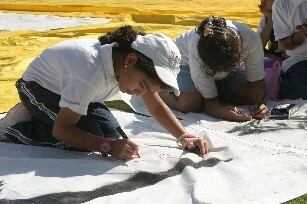 There will be smaller tarps laced to the main “letter”, which will be signed by the children of each school. 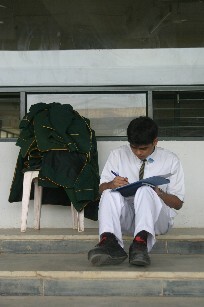 Upon delivery, the smaller tarps will be given to schools in Pakistan to promote a school-to-school exchange of letters. The “world’s largest letter” will be cut into smaller pieces and distributed in the earthquake ravaged areas of Pakistan. 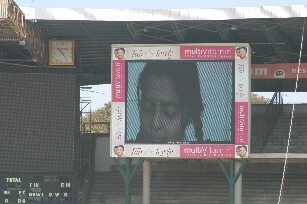 Forty minutes after rejecting the proposal to hold the inaugural ceremony of the unveiling of the “world’s largest letter” with 20,000 children in attendance at Chinnaswamy Stadium, the Secretary of the Karnataka State Cricket Association, former cricket star Brijesh Patel, asks what day we would like the stadium. We chose January 16, the fourth day of the first cricket test match between India and Pakistan in Lahore. Spot Image wants to know the coordinates of Chinnaswamy stadium so that they can position their satellites. 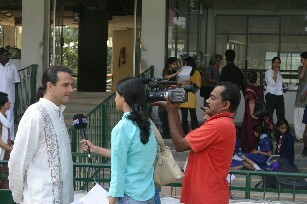 Ten Sports will show feeds from the ceremony at Chinnaswamy, filmed by NDTV, during the telecast of the test match. Mehgna and Gopi Desai are going to edit footage that Gopi’s crew has already shot at the offices of PlanetRead and BookBox in Mumbai. On January 16th, we will invite all the school children of India to participate in this project. Then we will take the “world’s largest letter” on the road to major metropolitan areas in India between Bangalore and the Pakistan border: Mumbai, Delhi, Ahmedabad, and Amritsar. The letter will then be delivered to Pakistan and tour the major cities there before being donated for earthquake relief.